Battling Tomato Anthracnose | Horticulture Talk! Thank you for the great question. 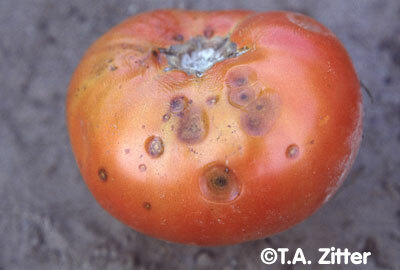 This time of year, with the harvest ending, is a great time to be addressing Tomato Anthracnose issues. Let me give you (and my readers) a little bit of background first to catch everyone up to speed. 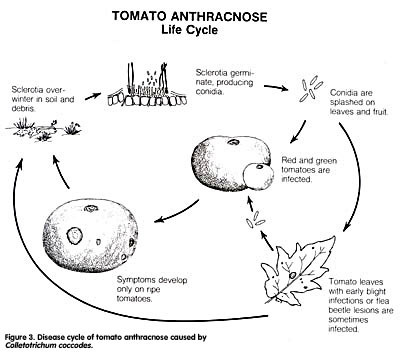 Anthracnose is a pretty serious fungal disease that can affect any gardener’s tomato or potato crops. It is cause by Colletotrichum coccodes, which is a coelomycetes-type of fungi that is characterized by colonies usually darkly pigmented with white aerial mycelium and numerous black sclerotia within light brown colored conidial masses. From what my customers tell me, the anthracnose in their garden ‘just appeared’ as the fruits were ripening. And, unfortunately, this is usually the case, as anthracnose doesn’t give too many indications that it is present before destroying your crop. When the fruit is green, it can be infected but will show no signs until ripening begins. As the fruit ripens, it becomes more susceptible to infection. Early on, the fruit will start to have circular depressed areas that soon look like they are water-soaked. As the fungi grows, the depressed areas turn into lesions, increase in their depth, and begin to darken at the center. If you look closely, you will be able to see lots of tiny little stalks containing spores. The spores are a coral/salmon color and are released when it is wet — dew, rain, irrigation, etc. As this entire cycle is taking place, your fruit because soft and decayed. If allowed to go long enough, the various lesions will merge into one large rotted spot. Of course, picking the fruit off and destroying it is a big step a gardener needs to take in addressing the issue of anthracnose. As always, my suggestion is to through any diseased fruit away in the garbage or to burn it. Some other horticulturists recommend composting the fruits; however, if your compost pile doesn’t get hot enough for long enough, you could be inoculating your garden with spores down the road. It is just not worth it. Another step you need to take in the way of prevention is to remove every stem, leaf, and old fruit from the garden in the fall. Garden cleanup is SO important! If you have had disease issues, I again recommend throwing the garden debris in the garbage or burning it. If you leave things in the garden or just till them in, the fungus survives the winter as sclerotia and hyphae in infested tomato debris. Sclerotia are special hardened fungal structures that prevent dessication. In other words, it makes a nice little cocoon for your spores so they can be rampant again next spring. Hyphae is the non-sexual ‘body’ of the fungus that can propagate by fragmentation. As soon as it rains or there is irrigation after transplanting your tomatoes in spring, the lower leaves can become infected by germinating sclerotia and spores that splash up from the soil. Infections of the lower leaves of tomato plants are important sources of spores for secondary infections throughout the growing season and will cause your plant to be more susceptible to other infections, like early blight. In addition to water splash, chewing insects like flea beetles and aphids can cause openings in the leaf surface that are perfect for the fungus to infect. Anthracnose thrives in soil that has poor drainage, so it is recommended to plant in areas that are well drained and to prevent splash back — use organic mulches, drip irrigation, allow for air circulation by staking your plants, and do not water from 4 PM-6AM so the plants are not wet overnight. Also, it is important to put your garden on a 3 or 4 year rotation so that no Solanacious crops will be grown in the area for 3 to 4 years (this includes Potatoes, Tomatoes, Peppers, Eggplants, Tomatillos, Ground Cherries, Huckleberries, Petunias, and Wonderberries). It is also important to maintain the Calcium and Potassium balance in your soil, as it will strengthen the skins of the fruit so they are resistant to fungal attack. There are also different fungicides that you can use. For the best recommendations, call your local agricultural extension agent to find out what products are legal and safe to use for your township/county/state. As for resistant varieties, there are currently none on the market as of the time this was written. However, supplementing your garden with varieties that are resistant to other common tomato problems, like Fusarium and Verticillium, will help your plants to stay healthy and be able to combat Anthracnose as well as possible. There are at least two resistant varieties, now: Chef’s Choice Orange F1 and Chef’s Choice Pink F1.